Jake Beaudoin surfing Yakutat, Alaska beneath the towering Saint Elias Mountains. 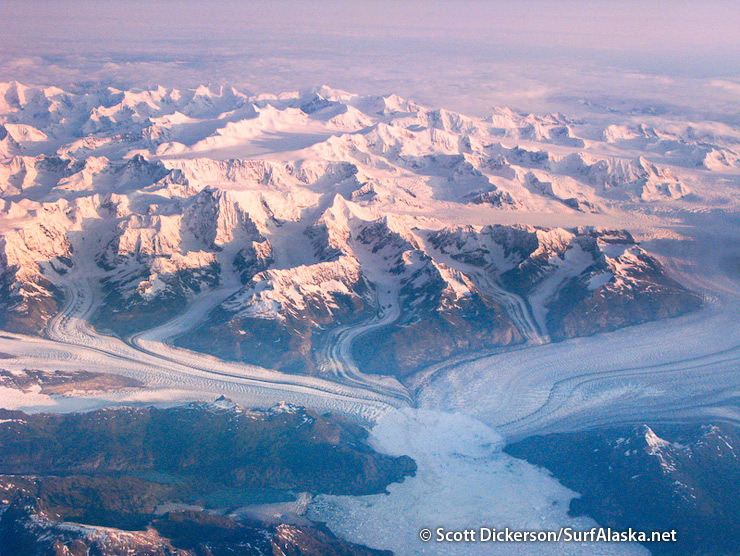 If you search online for information about surfing in Alaska you’ll quickly find that Yakutat is by far the most documented location. 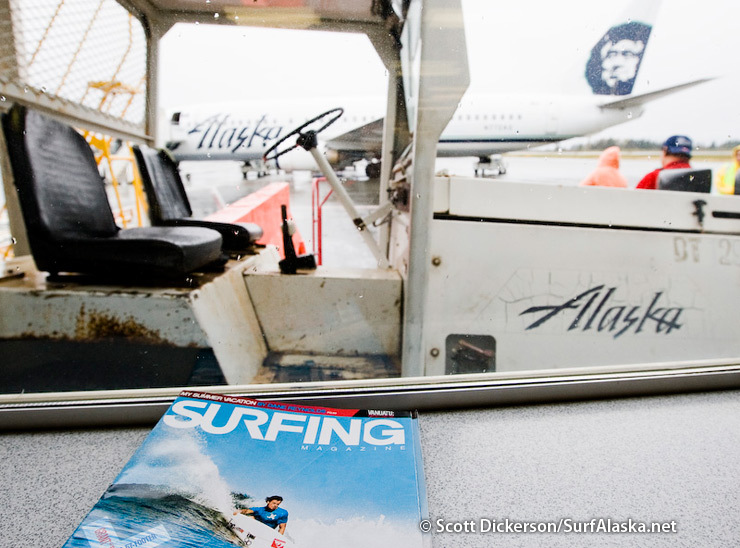 It seems that this is a case of magazines and newspapers following each others lead, if there is a published story about surfing in Alaska, it’s probably about Yakutat. 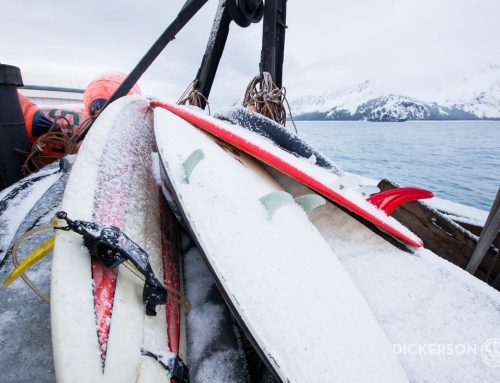 There are a few good reasons for Yakutat’s rise to fame in the Alaskan surf scene. 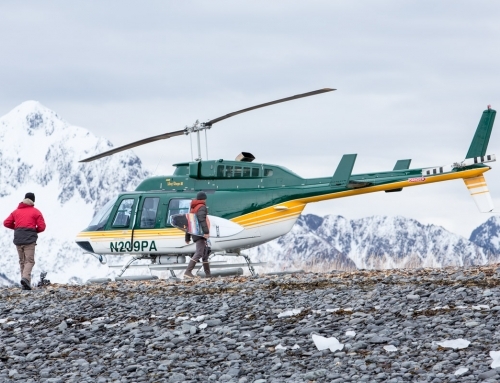 First it is undoubtedly the most popular Alaskan surf destination, and for good reason. 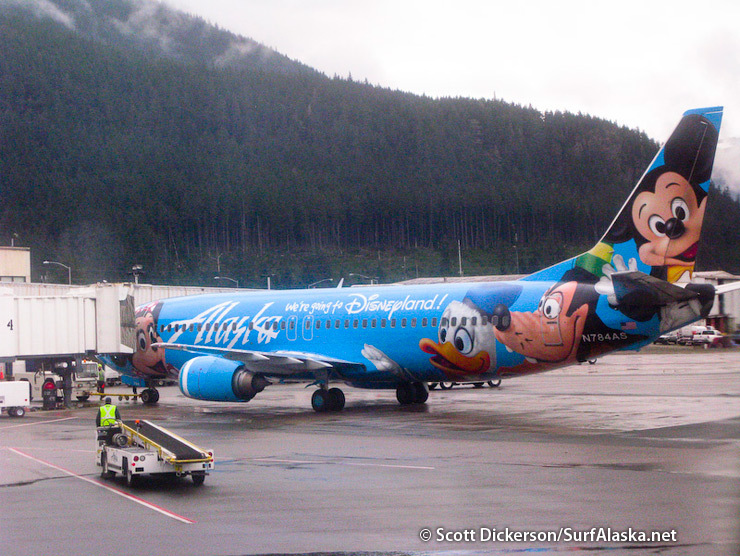 You can fly there easily from Seattle, Washington or Anchorage, Alaska with Alaska Airlines. 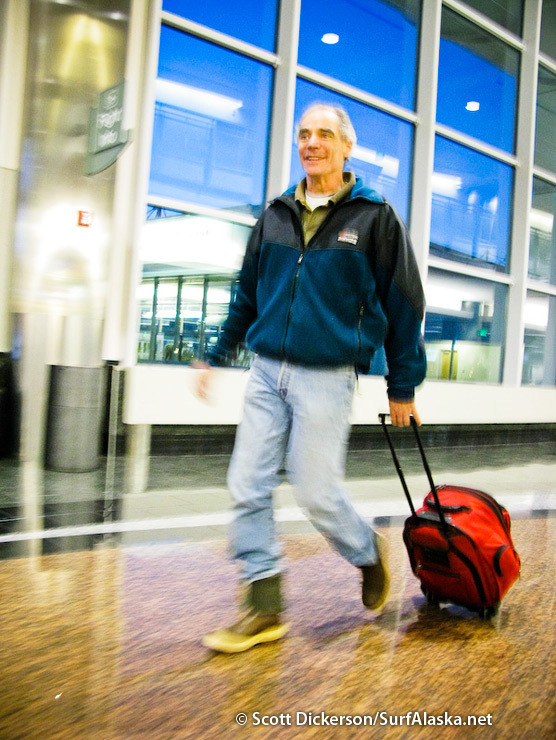 The tickets aren’t outrageous and the big jets landing there makes the travel logistics easy. Yakutat is also home to the Icy Waves surf shop owned and operated by a really great local guy Jack Endicott. It’s not just relatively easy to get to, Yakutat also has relatively consistent surf. Compared with Homer, it’s incredibly consistent! 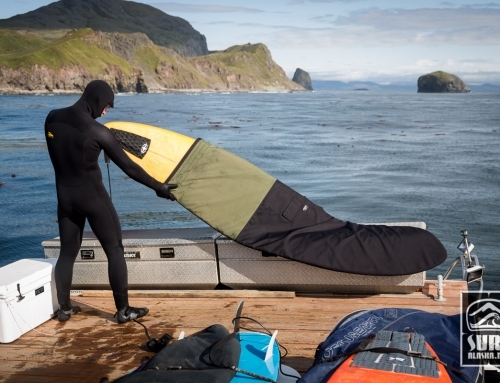 Yakutat also has a comparably long surf history for Alaskan standards. 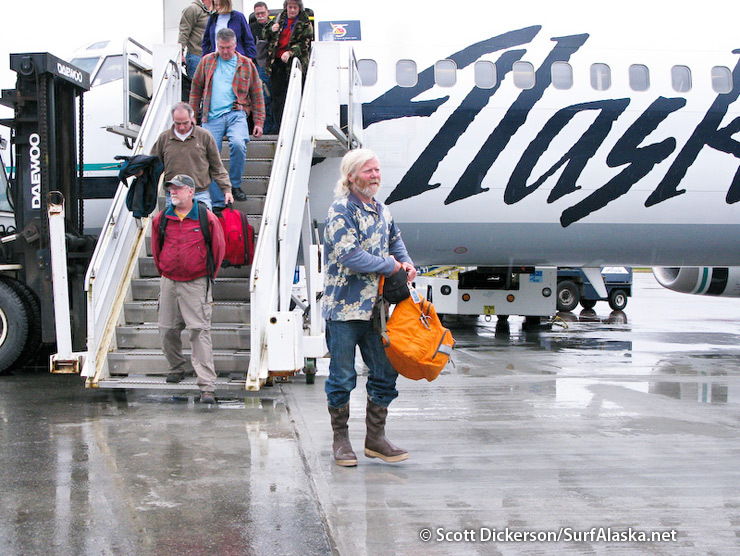 Outsiders aren’t the only ones that make surf trips to Yakutat. 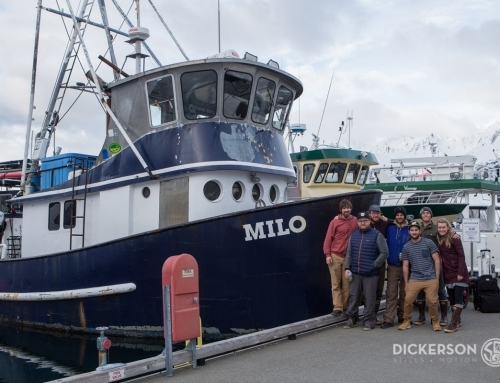 A mixed group of surfers and myself from the Kenai Peninsula and Anchorage area have made two trips down there in the last couple years. Spring and fall have the best surfing waves we are told, so we had one late May to early June trip and this year we spent the end of September and into October there. 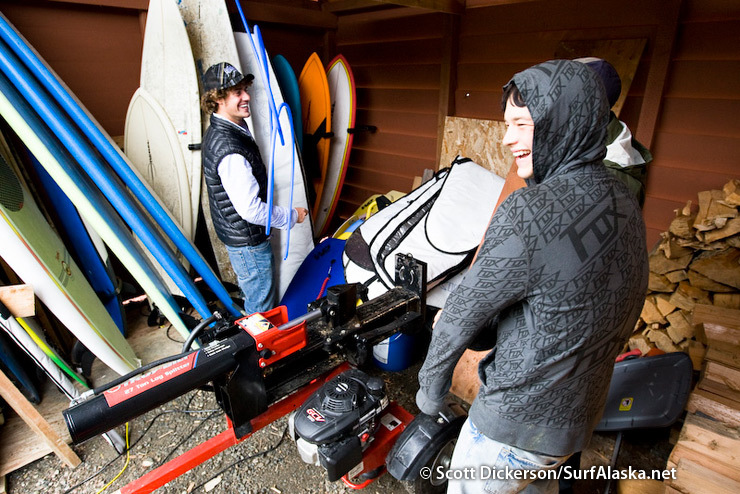 This post is part one of a report on the most recent Yakutat surf expedition. Mike McCune heading for the jet at the Anchorage Airport. Jake with his fancy black trash bag carryon waiting to board in Anchorage. True Alaskan style scenery on our flight from Anchorage to Juneau. 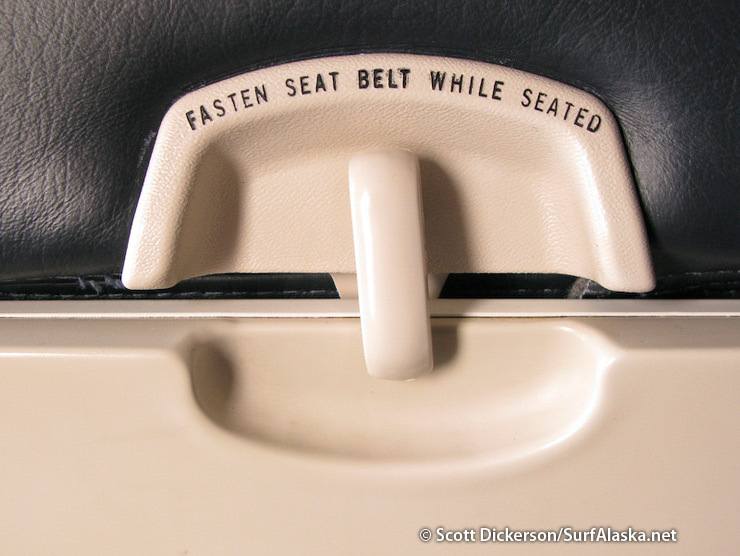 Pay attention to this sign on approach to Juneau. It can be a little exciting. 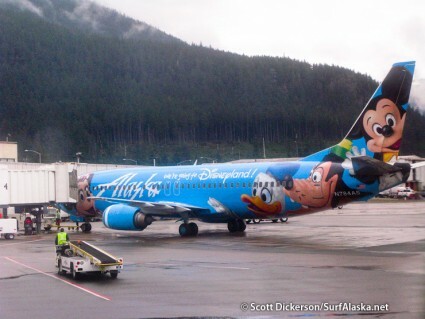 We are heading to our own form of disneyland. 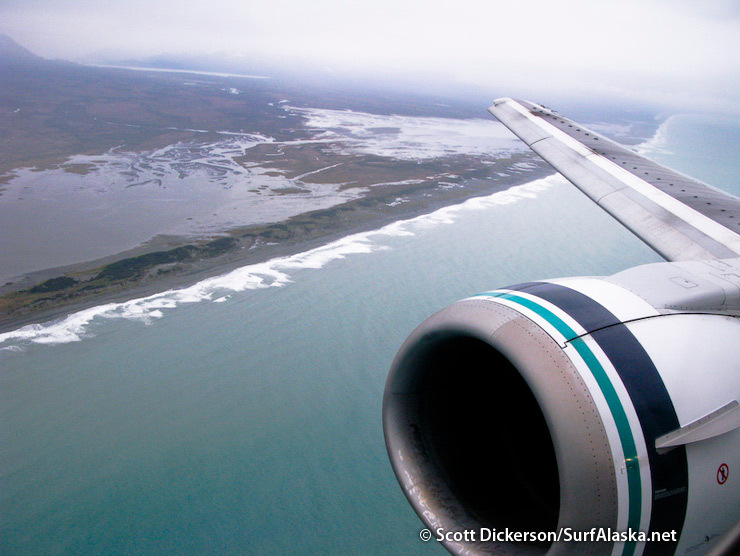 Every surfer has their face plastered to the window as we approach Yakutat, Alaska. Good news we see a surfable swell hitting the beaches. 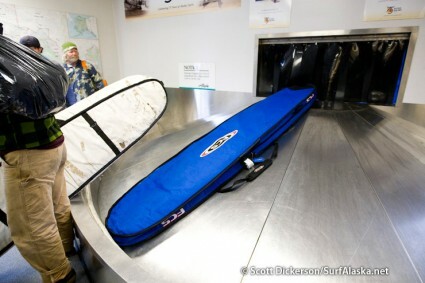 Iceman leaves the jet in Yakutat, Alaska.Surfboards at baggage claim in Yakutat. Surfing magazine with Alaska Airlines, some light reading while we wait for our boards and bags. Surfboards at baggage claim in Yakutat. 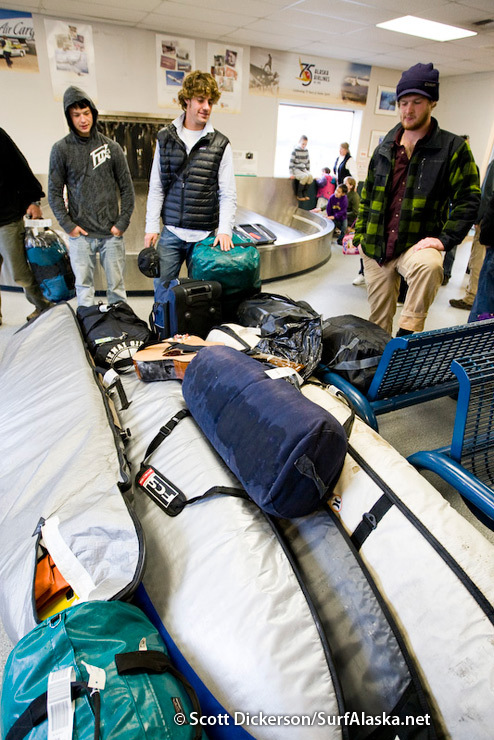 Our piles of gear and surfboard bags fill half the airport terminal. First stop in Yakutat - Icy waves surf shop. 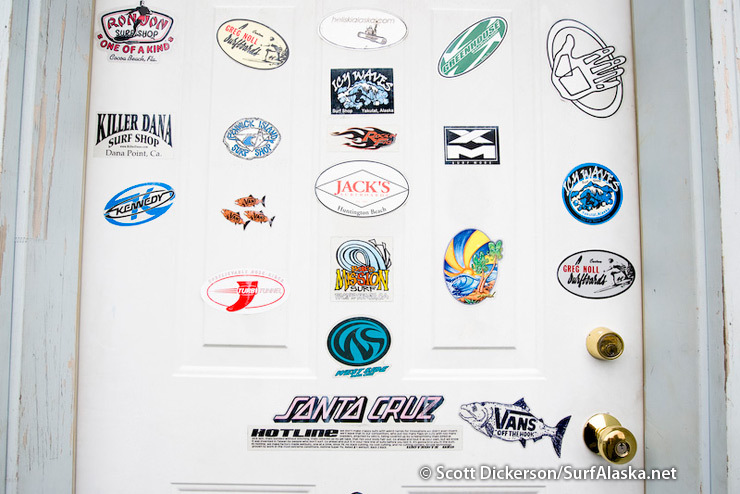 Icy Waves surf shop door signage. This must be the right place. Jack has a surprisingly good selection of boards and other stuff at his shop. 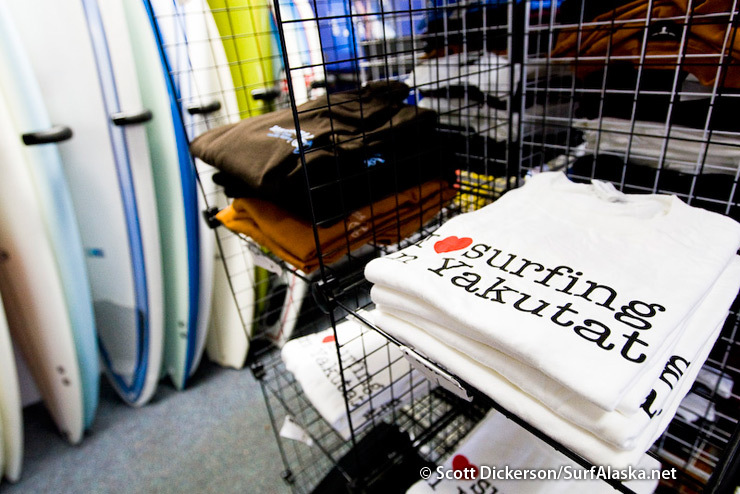 I heart surfing Yakutat tshirts. 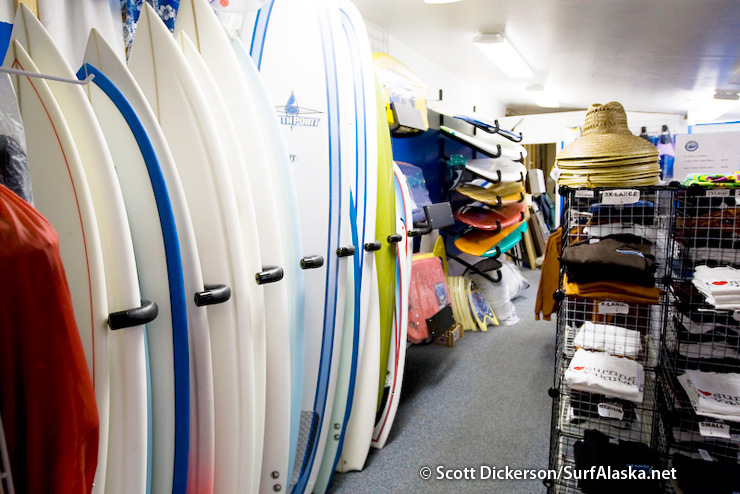 Checking out the rental boards at Icy Waves surf shop. They are there in the wood shed, behind the wood splitter. 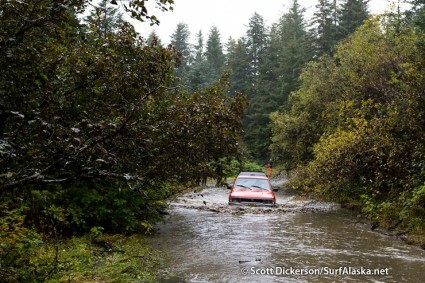 Rainforest sized puddles on the road to a surf break. 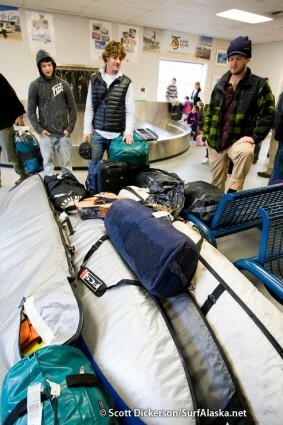 Ok, we made it to Yakutat. 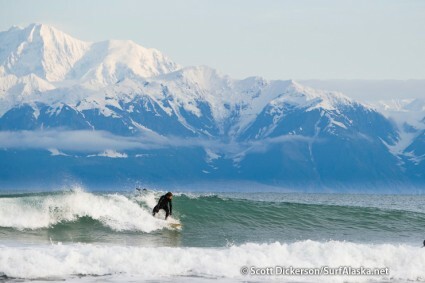 Next post I promise I’ll show more Alaska surfing photos. The forecast is looking pretty bleak around Kachemak Bay for the next few days so I might just find some time to keep working on this sooner than later. 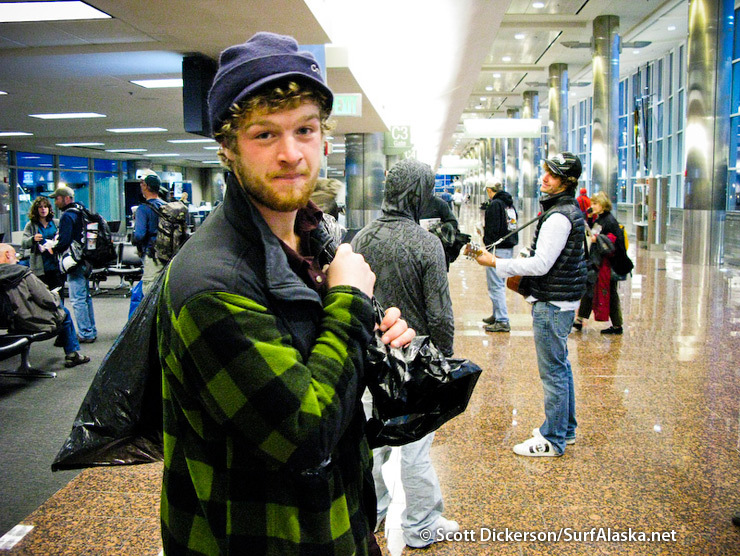 Reminder: If you have any surfing alaska stories and/or photos you’d like to share let me know. Looks like a great trip, if a bit soggy, but I bet you’d agree that rain beats crowds any day. 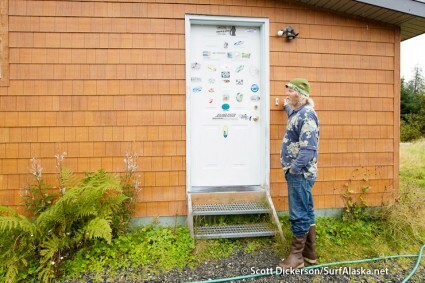 Do you guys ever run into local yakutat surfers? I know of 5-10 guys who live in yakutat and surf, maybe a few less who stay year around. 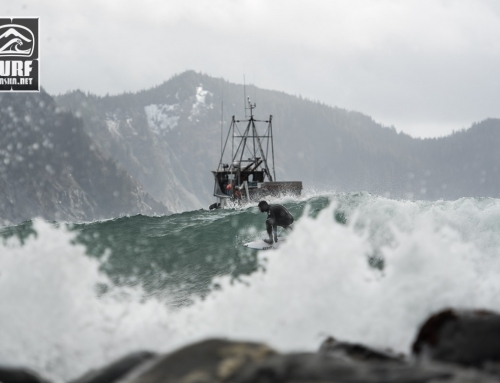 You’re right about the publicity Yakutat gets as a surf destination, but from my experience of living and surfing there it is mostly hype- there are the pro’s that come through for a weekend, and the die-hards like you guys, but my most frequent surfing partner is a sea lion. 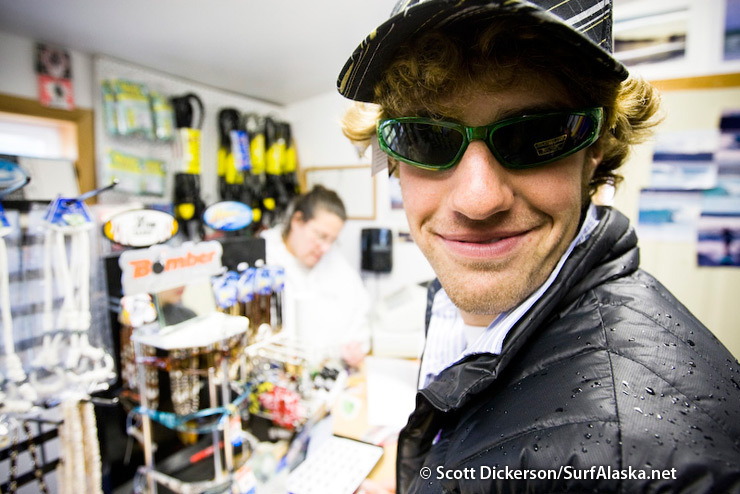 Hi Matt – We have met a few local surfers in Yakutat. But from what I’ve heard there are only a few left? Mostly just been us in the water so far and a few other traveling surfers. Certainly not crowded. Thanks for the kind words. Hope we cross paths in the water sometime.